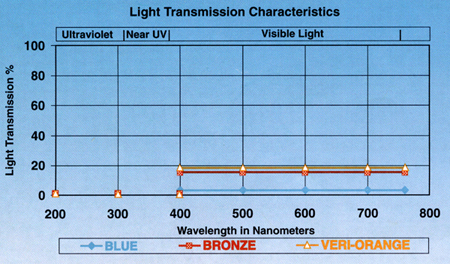 Blocks over 99% of UV radiation. 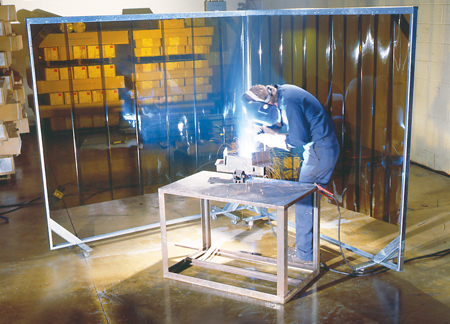 Designed for welding booths as well as spraying, grinding, and sand blasting enclosures. This VERILON®Vinyl Strip is fire retardant, highly transparent, noise deadening - and prevents dangerous near UV and UV radiation from penetrating adjacent areas. It is not intended as a substitute for approved eye protection which should always be worn. Available in 80-gauge thickness in a strip width of eight inches, in colors of bronze, veri-orange and blue; or heavy duty 120-gauge thickness in a strip width of 12 inches in bronze. Available in flat only.